This book uses the puzzle formats children are familiar with in school such as word searches; crossword puzzles and codes. It’s a fun way to work through the Westminster Shorter Catechism – one of the church’s statements of faith. Not only will they enjoy completing these work sheets; the truths that are presented here will be a strong foundation for their future life. The shorter catechism covers the following important doctrines: God; Sin; Christ; The Ten Commandments; Baptism; The Lord’s Supper and The Lord's prayer. 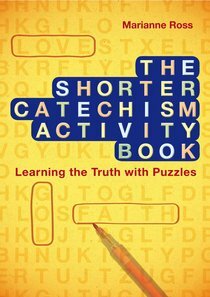 About "The Shorter Catechism Activity Book"
Marianne Ross lives near beautiful Loch Lomond in Scotland. As well as being a wife to Philip and mother to three growing children she is involved in a women's bible study group and her local children's cross country club.